How to develop a business proposal for potential investors? A lot of entrepreneurs come in with this kind of question, and many of them believe that if they don't have a business degree, they can't write a winning business proposal. However, they often forget that investors are not experts in all fields, they are generalists who want to see that you will be able to make them money. That is why your business plan does not have to be super complicated to get an investor interested in it and invest. In this article, we are going to guide you through the most critical things that should be included in your business plan. We will also tell you how to position everything to motivate investors to take action. What is a business proposal for investors? In the corporate world, most large projects, winning mergers, etc. begin with a very powerful and important document — a business proposal. In simple language, it is a written offer from a seller to a potential buyer. Its primary goal is to persuade the prospective client, answer all their questions, prove you are the best candidate to be chosen. And in order to create the proposal that will answer questions of investors, you must do your homework first. It is essential to demonstrate to investors that you understand your clients, know their needs and requirements and that your solution will satisfy these needs. Gather as much data about the market as you can, because you need to make potential investors believe that this market is big enough to get excited about it. Along with information on the market size & potential, your ideal buyers picture, the ability of your product or service to satisfy your customers, you also have to inform your potential investors how you will prevent your competitors from taking away your clients. Ideally, the proposal should be tailored towards the type and needs of a specific investor, because different types of investors concentrate on different parts of a business plan. For example, bankers put more emphasis on the financial aspects of the proposal and pay less attention to the market. And angel investors stress both market and finance issues. Follow these tips to succeed in writing a business proposal for funding. Your proposal might serve as a representation of how you run your business. If it is well-thought out and structured correctly, you will be treated as a professional. Be sure to check if there are no spelling or grammatical errors in your documents. Ask someone you trust to proofread the proposal after you. Be persuasive. To increase your chances with a pitch, plan everything properly, show that you did considerable research, introduce your skilled and reliable team. Remember that your business plan shouldn’t be like a tedious book report but an evolving document. So you can make it personal and informal. Keep in mind that investors are usually short on time. Therefore, too complex and too lengthy proposal is almost never a good idea. 15-20 pages (excluding appendices) would be perfect. Your proposal should include the following components: executive summary, introduction, project details, and conclusion. When working on your executive summary, keep in mind that it should be so easy to understand that your grandmother can understand it (no jargon, short forms, technical terms). It should be a condensed version of the more detailed proposal which you will explain throughout your plan. We suggest you make it 1-2 pages. Keep in mind that the executive summary section is very likely to be the ONLY chapter of the business plan that the investor will read in full. The introduction paragraph should provide an overview of your business. Location — Include your company location and any facilities that your company owns. Tell what your location means to your business. In this section, you need to describe how you plan to achieve the goals. Also, provide an overview of your resources such as staff and technology that will help you reach these goals. It is also essential to explain how you plan to measure your progress. Financial plan — It should contain the income statement, the cash flow projection, and the balance sheet. Milestones — Present the core milestones that your team expects to achieve. For example, reorganize social media accounts (due date October 20, 2018), hire a project manager (due date October 25, 2018), launch a new website (due date November 10, 2018), launch a Japanese version of the software (due date February 2, 2019), etc. 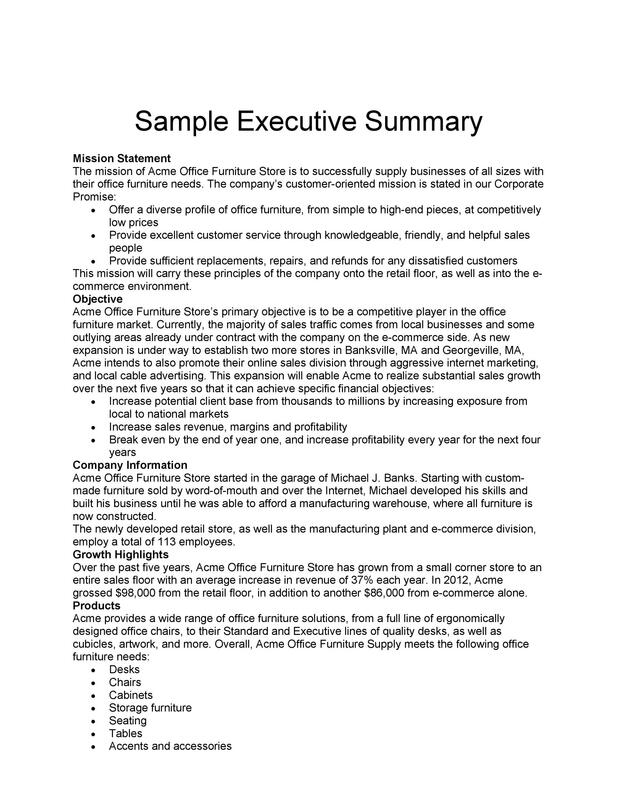 The conclusion section reviews what the business plan has stated. Include a specific call to action in this chapter. Supporting documents and other information — These may be a full business plan, income statement, balance sheet, statement of stockholders’ equity, capital requirements, comprehensive document about the product or service, letters of support, reference, or credibility, marketing plans, credit reports, industry awards or customer letters, quotes or estimates from builders, contractors, etc. You know how to measure your success.